Gastro Park Kapitolyo is our newest food rave! When In Manila, food parks are the thing these days. 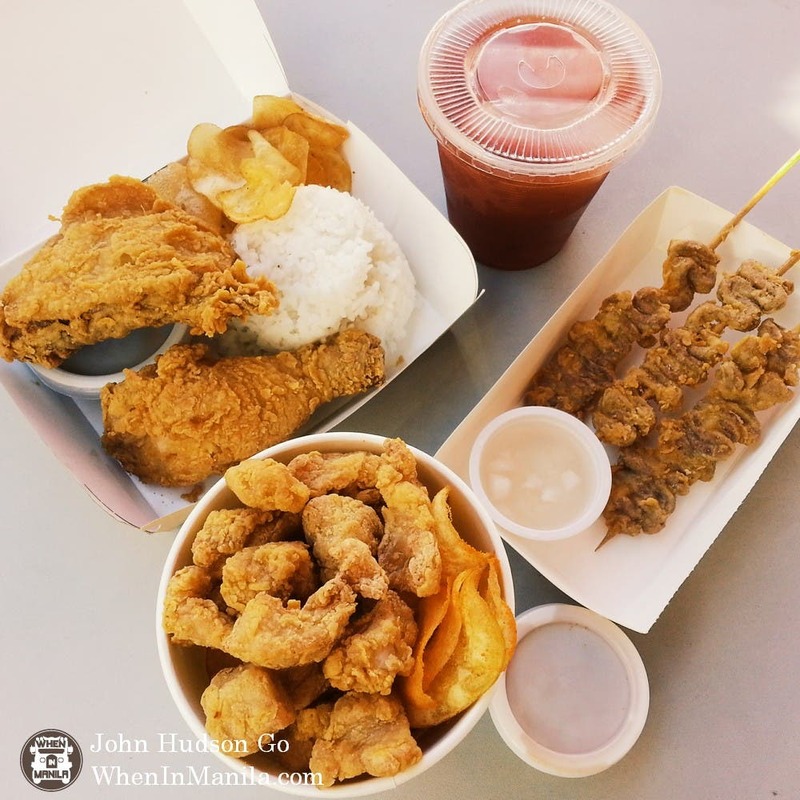 Gastro Park in Kapitolyo, Pasig is one of new players in the food park business, and we took sweet time in critiquing the mouthwatering bestsellers of the 15 vendors that make up this chill yet awesome food joint. If you’re wondering, “Why just five?” I’d like to clarify that this list is in no way prescriptive. Different people have different tastes. That said, if I tell you to try everything, then I end up not providing any valuable information at all. I’d like to think of myself as a hard grader. (Ask my students from Enderun; they’d agree.) And I’ll never sell you any bullsh*t. So let’s agree on this: Consider this list for your first visit in Gastro Park Kapitolyo, but don’t be afraid to explore the possibilities because, let’s face it, we all want to be pleasantly surprised at times. These ribs had me at hello. It was love at first bite. Seriously, the “zing!” I got when I bit into Brick Plate’s home recipe ribs was instantaneous! The meat was tender, generous, and falls off the bone. (I hate it when I order ribs and they look like they came from an animal that endured famine!) The homemade sauce that they basted the ribs in is topnotch. There are good ribs in town; this is a great one! And at 180 pesos, Brick Plate’s Shaker Ribs are a steal! If you’re craving for pizza, Brick Plate’s pulled pork and sweet-yet-cheesy variants are worth trying also. Yakitori, like most Japanese delicacies, looks so simple and elegant, people don’t realize how painstaking it is to serve a beautiful stick of chicken skin or bacon-wrapped quail eggs. A certain measure of obsessive-compulsivity is necessary in lining up the ingredients perfectly. Just the right amount of basting sauce should be used; not overpowering the natural flavor of partially burnt meat, skin, bacon. And the time at the barbecue pit, that’s a tough number to crack. During our visit, Niku-Q served us perfect sticks of chicken thigh, skin, asuparabekon (asparagus and bacon), and quail eggs and bacon. Wafting the smoke as our order was being prepared reminded me of my days as a college undergraduate in UP eating at Mang Larry’s isaw cart. Only, this is so much better. When I saw the ginormous food jeepney parked in front of Gastro Park Kapitolyo, I honestly thought Para was serving more gimmickry than straight-up good food. In fact, I went around, trying the food from the other stalls, because I was almost certain they took more time converting the jeep into a food truck than actually thinking about their menu. Boy, I was dead wrong. Para’s Lechon Pares Sandwich uses Tatang’s Cebu lechon for its meat, topped with freshly pickled cucumbers and salted egg, sandwiched by a 5-inch griddled pan de sal. 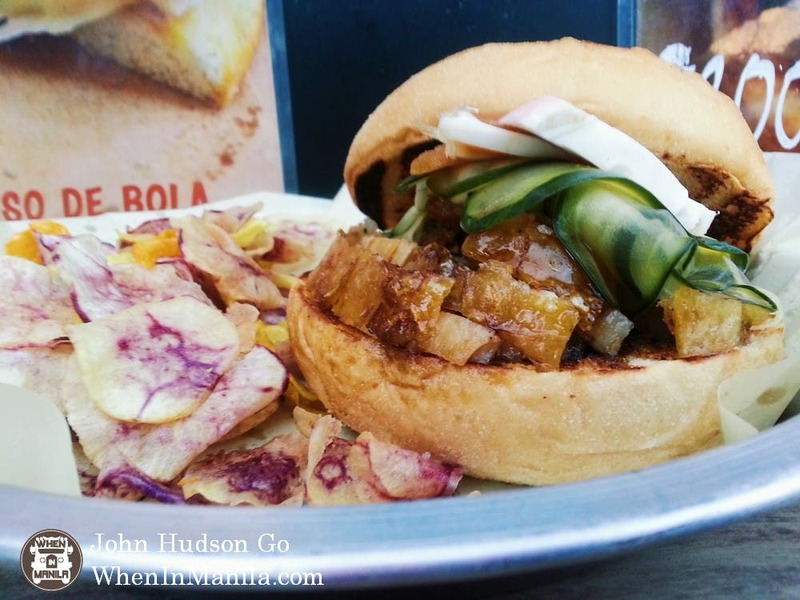 What you get is a flavorful lechon sandwich with a sour note (thanks to the cucumbers) that is reminiscent of Macau’s famous porkchop bun, but truly Filipino. If you don’t feel like mowing down an oversized sandwich, their calamansi-glazed chicken lollipops are a must-try as well. 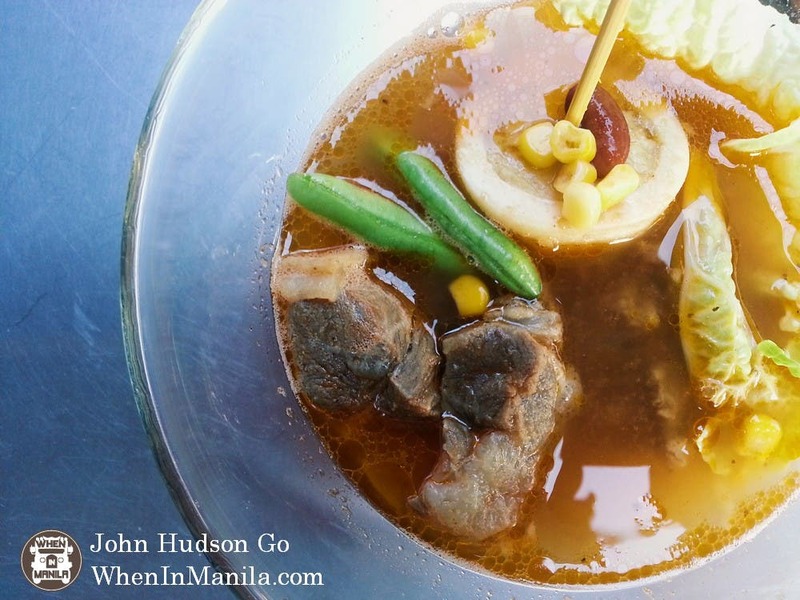 This is not your ordinary bowl of bulalo soup. Tolyo’s makes sure you taste the “Mexican” in their Mexican Bulalo. Putting in the paprika, the cumin, the pinto beans, the works, my brain was screaming “AGAVE!” as I slurped my first spoonful of the soup. The bulalo comes with generous portions of tender beef, and the chunkful of marrow is just cholesterol heaven! (You know the disappointment you feel when you and your friends drive up to Tagaytay just to have bulalo, only to find out that the marrow has melted in the soup? Well, that’s not a problem at Tolyo’s!) All this for a price under 200 pesos! Bagnet rice or bagnet sisig? Bagnet sisig or bagnet rice? At Bagneto’s, you are faced with a tough choice between two crunchy options. Bagneto does their bagnet right. Proper bagnet should taste and sound like a hybrid of lechon kawali meat and chicharon skin. Gorgeous slices of bagnet are paired with rice for your guilty pleasure. (In our case, my friends and I munched on the bagnet slices without minding the rice!) If you’re looking for something different, Bagneto’s sisig is made entirely of crunchy bagnet, with a lovely egg cracked on top of it. Whichever you choose, you can’t go wrong. If deciding between the two is too stressful, just order both! Now, these are proper milkshakes. Sweet Nothing enters our list as an honorable mention because technically, it isn’t a food stall. That said, their premium milkshakes are beautiful, refreshing, fun. The flavors blend perfectly with the generous vanilla ice cream they put into their shakes. What you get are milkshakes that are thick yet smooth, not the watered down version in too many commercial establishments. The strawberry shortcake shake was ingenious; the strawberry-flavored cotton candy on top ‘fizzles’ as you poke your straw into the shake. 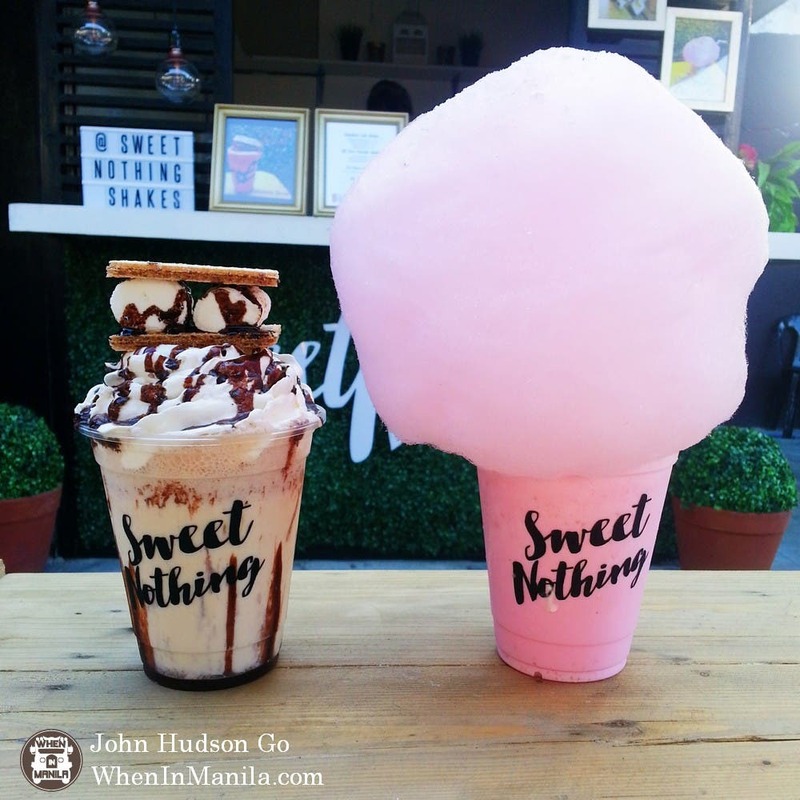 I’m not a fan of strawberry-flavored anything; Sweet Nothing’s offering is one of the rare exemptions. The Seventh Element specializes in serving flash-frozen ice cream for the geek in all of us. It was so much fun to watch them pour the liquid nitrogen into the industrial mixers and turn the fresh cream inside into, well, ice cream. They also have a fine selection of flavors, such as cookies n’ cream, salted caramel, avocado, and chocnut. But my favorite was the blueberry cheesecake ice cream, dashed with crushed grahams on top to give you that genuine cheesecake feel! Here are the bestsellers from the other stores inside Gastro Park Kapitolyo. El Phante’s Thai-Mexican fusion offerings are very, very hard to pull off. Our group was literally divided when we discussed the merits of their bestseller, the Pad Thai-Mex. If you’re a purist, there’s a high chance you wouldn’t enjoy the experience. In my case, I had a lovely Thai lady as a classmate in graduate school who every so often cooked for us. (She catered as a business.) That was my reference point, and El Phante’s version is far from that. That’s actually good, because if you’re more open-minded about the fusion cuisine being offered, you’d find the Pad Thai-Mex surprisingly delicious, offering an interesting flavor profile that is fresh (thanks to the basil) and strong at the same time. Cheese lover? French fry lover? Surfries serves up cheesy fries like it’s your last day on Earth. Their signature KABOOM! fries has smoked bacon and spring onions as garnish. Then it’s topped with melted cheese that is BLOW-TORCHED for your cheesy pleasure. Chixy9 is deep-fried chicken heaven. They have everything from chicken thighs, chicken pops, chicken skin, to chicken neck. What we went back and bought to take home for that day, however, was their chixisaw – chicken intestines in batter deep-fried and served with white vinegar. If you’re not the health-conscious type, sobrang sarap nito, promise! I love Indian food. I frequent New Bombay whenever I’m in need of some heat – for my taste buds. I look for the rich, intense flavor profile that only Indian food can offer. Food at The Masala Bar isn’t as hot as your traditional Indian restaurant. The concept behind it is to invite people – Indian food-aversive Filipinos in particular – to enjoy good food infused with Indian herbs and spices. It’s a non-threatening Indian joint, that’s what it is. Tokyo Tempura offers Japanese fried goodness in buckets or unlimited portions. If you’re crazy for tempura, then this is the place to go! I loved the chili cheese tempura! Gave me the heat I was looking for. At 49 pesos a bucket, I consider this a bargain! 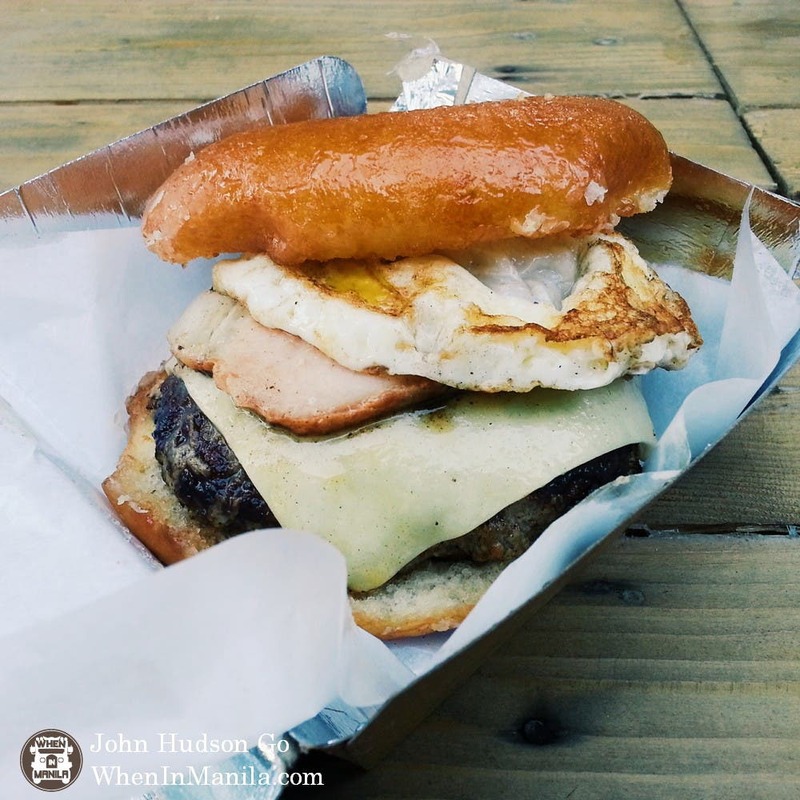 So you have an oversized burger patty, topped with cheese, bacon slice, and fried egg, with a glazed donut as bun. I don’t even know what to make of the Stuffed Offbeat Burger! Personally, I liked how the bacon slice gave the burger a distinct smoky taste that stands out from the craziness of this uber-flavorful treat. The Singapore hawker culture is right at our doorsteps as Wok offers classics like nasi goreng, char kway teow, and Hainanese chicken. What I love about Wok is its unpretentiousness. No gimmicks. No embellishments. Just straight-up good ol’ hawker food, done right. Finally, you have a stall that offers familiar Japanese food in a box. Here’s the thing: I’m a spoiled brat when it comes to Japanese food. One block from our house is an izakaya owned by a Japanese chef and his Filipino wife. That said, when in Pasig and you’re looking for a Japanese quick fix, then Japbox is for your consideration. And there you have it, our top reasons for visiting Gastro Park Kapitolyo. What are you waiting for? Grab your friends, drive up to Kapitolyo, Pasig, enjoy the food, and tell us if you agree. For the food park schedule, announcements, whatnot, check out Gastro Park Kapitolyo on Facebook. For those who have gone to Gastro Park already, what other items do you think should be in this list?